The internet suffered a number of slowdowns as people the world over rushed to verify accounts of Michael Jackson's death. The BBC news website reported that traffic to the site at the time of Jackson's death was 72% higher than normal. The microblogging service Twitter crashed with the sheer volume of people using the service. 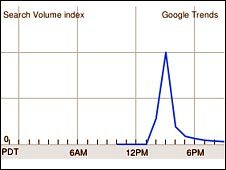 According to initial data from Trendrr, a Web service that tracks activity on social media sites, the number of Twitter posts Thursday afternoon containing "Michael Jackson" totaled more than 100,000 per hour. Early reports of Mr Jackson's death and the confusion surrounding it caused a rash of changes and corrections to be made on his Wikipedia page as editors tried to keep up with events and the number of people trying to update the page. There was a domino effect as users then fled to other sites. Hollywood gossip writer Perez Hilton's site was among those to flame out. 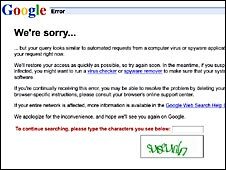 Keynote Systems reported that its monitoring showed performance problems for the web sites of AOL, CBS, CNN, MSNBC and Yahoo. Beginning at 2.30PM Pacific "the average speed for downloading news sites doubled from less than four seconds to almost nine seconds," said Shawn White, Keynote's director of external operations. He told Data Center Knowledge that "during the same period, the average availability of sites on the index dropped from almost 100% to 86%".